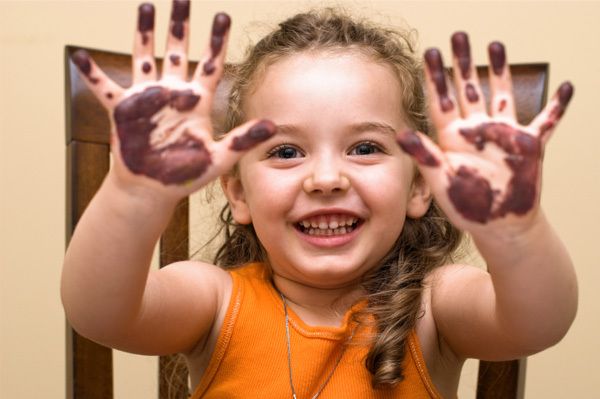 Kids love to get messy, but cleaning up can be a real headache. During the summer months, move your craft session outside, where all you need to clean up is a hose and a beach towel. Your kids will love these fun crafts almost as much as they’ll love the mess they make in the process. It’s OK, Mom — it all cleans up! Kids love this one because they’re playing with cars and getting crafty at the same time! Set out several paper plates, and squirt a different color of washable paint on each plate (you’ll need a lot of each color). Run your toy cars through the paint, and then over the paper. The wheel tracks the car makes will serve as the art. Leave them out in the sun to dry. If you want the kids to help with the clean-up, set out a bucket of soapy water and ask the kids to take the cars through the “car wash” when they’re done painting. This is a fun way for kids to play with their sand when building sand castles get old. If you don’t have a sandbox, use large tubs or pans filled with a few inches of sand. Fill your spray bottles with water, and then add enough food coloring to each bottle to make a vibrant shade. It’s best to let the adults handle this step because food coloring isn’t the easiest thing in the world to clean up. Let the kids use the spray bottle to spray color onto the sand, creating whatever they please. If they want to start over, simply stir the sand around for a clean slate. You’ve always told your kids not to play with their food, but this fun craft is a great exception. Make sure to have them wear old clothes or bathing suits, because this mess may not come out of clothing. Choose any fruit with a color you like — any variety of berry works great — and mash it up in a bowl with a fork or spoon. Let your kids help with this process — it’s half the fun for the little ones. Once you have a nice puree, let your kids use it as finger paint. You’ll have a sweet-smelling work of art when they’re finished. Sidewalk chalk is great for outdoor crafts because all you need for clean-up is a water hose or a good rain. These works of art won’t last long, so take a picture if you want to preserve them. Have your kids lie down on a sidewalk or driveway and trace their outlines with sidewalk chalk. Once you’re done, let them get up and hand them the chalk. Let them have fun drawing in clothing, accessories, a face and hair. End your craft session with a run through the sprinklers to clean up and end on a fun note.